This is the soup you want to come home to if you’ve spent the afternoon outside and let dusk fall around you, the chill creeping until your cheeks are flushed and your fingertips frozen. If by any chance you’ve already cut the squash and prepared the cubes (undoubtedly the lengthier proposition in this recipe), the rest can be assembled fairly quickly. 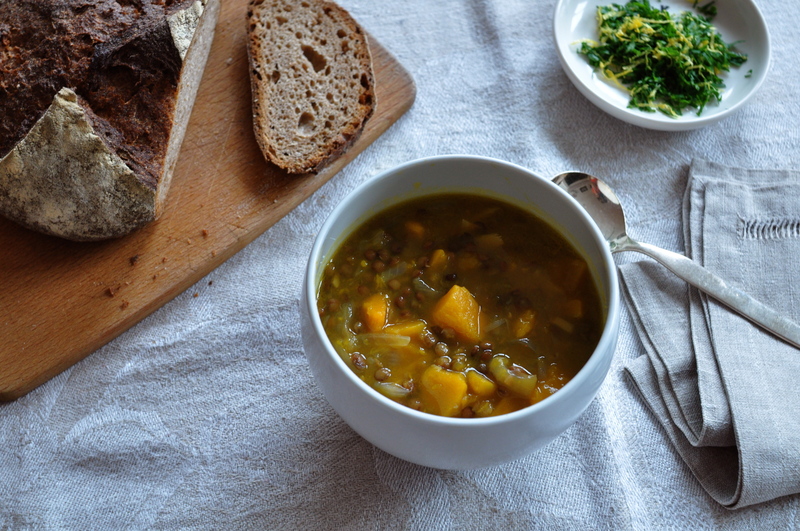 The warmly spiced lentils and faintly sweet squash spring to life with a jolt of lemon, but what really makes the soup sing is the gremolata of parsley, lemon rind, and chili flakes. 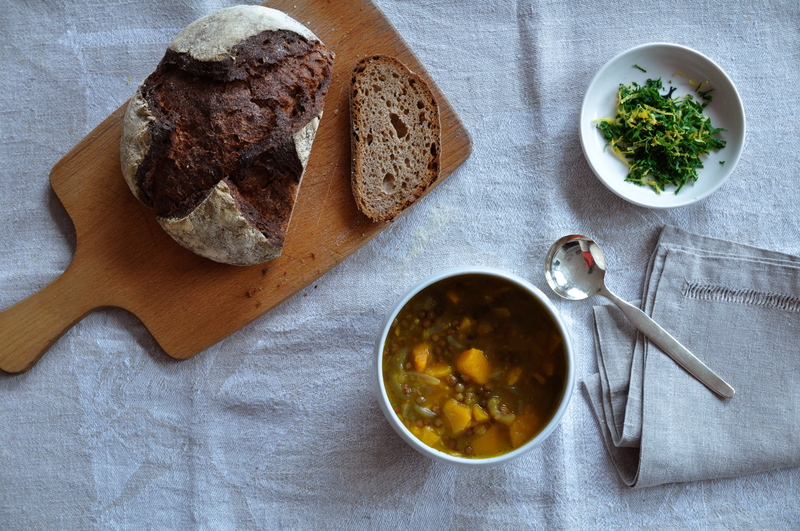 It is inspired by another incredible lentil soup I had at ABC Kitchen a couple of years ago. I kept note. Peel and cut the squash into 1-inch (2.5 cm) pieces. Check lentils for small stones and wash in cold water. Peel and thinly slice the onions lengthwise (into half moons). Peel and finely chop the garlic and ginger. In a heavy-bottomed soup pot, heat a couple tablespoons of olive oil. Add the onions and cook over medium heat, stirring regularly, until they become golden, about 7 to 10 minutes. Add the garlic, ginger, and a good pinch of salt, and cook for another 3 to 4 minutes, stirring often. Now add the squash and cook for another few minutes, stirring often all the way to the bottom of the pan to mix everything well. Season with more salt. Pour in the lentils, cover generously (by at least 1 inch or 2.5 cm) with water, and cook at a gentle simmer until the both the squash and lentils are just soft, approximately 25 minutes. Pour in the lemon juice, starting with 1/2 lemon, testing for acidity, and add salt if needed. Serve with a large spoonful of gremolata. Finely chop the parsley. Mix with the lemon zest, chili flakes, and just enough olive oil to coat. This entry was posted on 17 November 2012 at 14:45 and is filed under Fall, Fall soup, Lentils / Chickpeas / Legumes, Soup, Vegetarian, Winter, Winter soup. You can follow any responses to this entry through the RSS 2.0 feed. You can leave a response, or trackback from your own site. Delicious! I just made it and ate it. So happy to hear! Merci, maman.